While not really a weeknight dish, homemade onion soup makes a wonderful but very flavorful and heavy starter. It can also be a full dinner, especially if served with some more bread and a nice salad. Flambéing the soup at the table adds flavor and a fancy note. Peel onions, cut off trunk, cut in halves and slice as thinly as possible. Slices should be equal thickness (see Notes). Set large heavy pot over medium-high heat. Render bacon, do not brown too much. Add butter. Melt. Add onions. Cook over medium heat until they release liquid. Stir frequently. Now you can turn up the heat to high and cook until the liquid has almost evaporated. Stir from time to time. Reduce heat and slowly caramelize the onions. Stir frequently and scrape the botton of the pan with a wooden spoon to prevent scorching. When the onions are nicely browned and the bottom of the pan is covered with the caramelized juices, add 1 cup / 120ml of water in very small steps, keep cooking and stirring and wait until the water has evaporated before adding the next shot. Add the remaining water and chicken stock. Reduce heat and simmer for 10 minutes. Season with salt and pepper and add the chopped parsley. Fill onion soup in oven-proof bowls (6). Stick in some bread cubes and pieces of brie (optional). Top with grated swiss cheese. Bake until cheese turns bubbly and starts to brown. 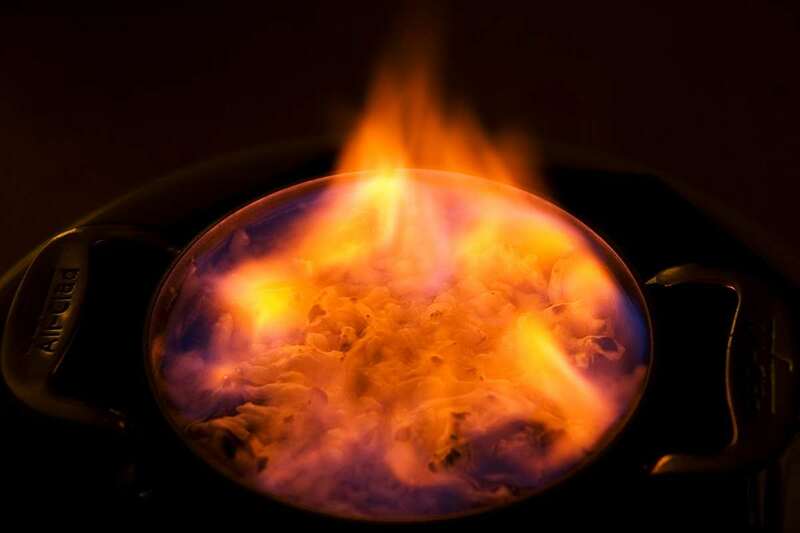 To make Onion Soup Flambé (optional): Warm up the brandy, it should be a bit more than hand-warm. At the table: Pour over the hot(!) soup and cheese and light with a long match. Cooking onion soup is one of the few occasions where I think it's worth the effort to get my mandoline slicer out. For a vegetarian version: Replace the bacon with 2 tbsp of butter. Substitute chicken stock with vegetable stock. When making the onion soup flambé be careful to not burn down the house. Make sure you don't spill any brandy and know where you can find your fire extinguisher. It works well to prepare onion soup in advance. Refrigerate after cooking the soup. 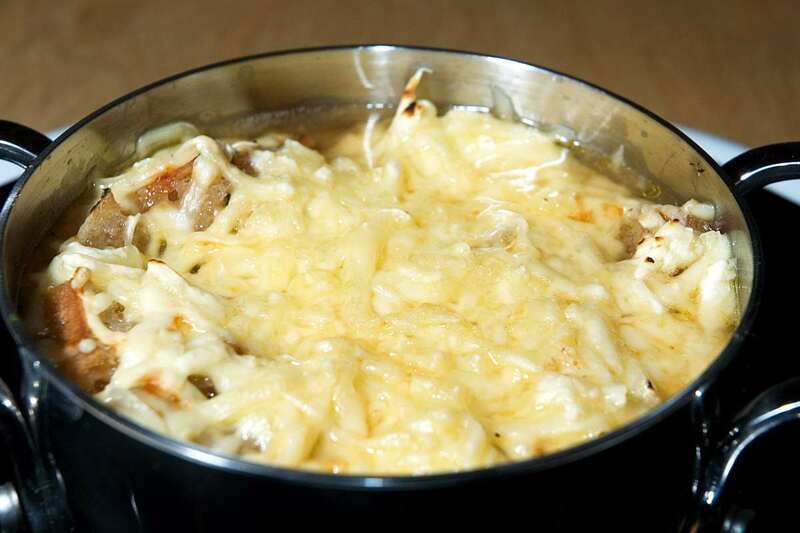 Add bread cubes and cheese right before reheating and reheat in the oven for best results.